Perfect texture, just the right amount of richness and Yummy! Winter weather always puts us in the mood for baking — something about the oven on and warm, sweet smells in the kitchen that are so cozy! And nothing is better than this classic combo! Besides at the end of the week, we always seem to have some ripe bananas in the house so freshly baked muffins is the perfect use for them! This recipe is from my mom and it is one of those super simple recipes that adapts so well to dietary needs and preferences. The original recipe was obviously not gluten-free but you can’t tell the difference using gluten-free flour. 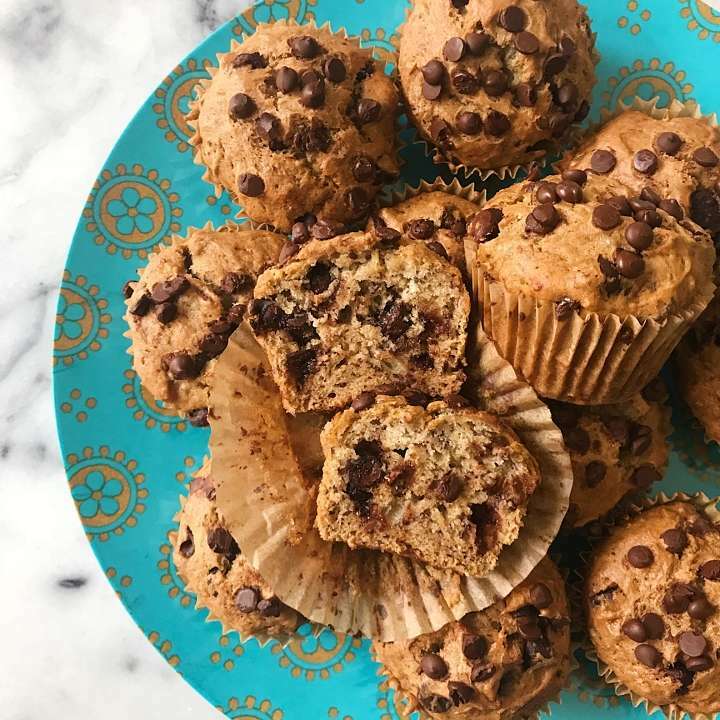 We’ve also made with dairy-free butter and flax egg making it vegan and you can add more or less chocolate chips or nuts depending on tastes and dietary needs. No matter how you make it, these muffins have a perfect texture — moist, not dry or crumbly– and are yummy! Just the right amount of banana, chips and richness! As with many of out other baked goods, we used GF Jules All-Purpose Gluten Free Flour. (Affiliate link) It has been our go to gluten-free flour for years as it is easy to substitute 1 for 1 in non-gf recipes. BONUS! For the next 2 days we are offering a Flash Coupon on GF Jules (affiliate link) products on her website! Use code HGFF for 15% off any order over $20, now through January 14. An easy family recipe that works well no matter what your dietary preference or need --- Gluten-free, Dairy-Free, Vegan, Nut -Free-- you choose! You could even leave out the chocolate chips and just make Banana or Banana Nut Muffins! Preheat oven to 325 degrees F and line 12 full size muffin tins with baking cups. Using a large spoon divide batter evenly among the muffin cups. Top with additional chocolate chips if desired. Bake for 30 minutes. Cover with foil and bake an additional 5 minutes or until wooden pick inserted into center comes out clean.